Starting around the 1840s in the United States, a movement known as Spiritualism swept across the country, staring in upstate New York. Practitioners believed in communication with the dead. The movement exploded in the 1860s, due in part to mounting casualties of the Civil War. Miskatonic University Associate Professor of American Studies, Dorothea Strange, files this report on Spiritualism and the Lincoln White House from Washington, DC. When Abraham and Mary Todd Lincoln moved into the White House in 1861, Mrs. Lincoln already had an interest in Spiritualism. But in February 1862, the Lincolns’ son Willie became very sick, probably from Typhoid fever, and died. He was 11 years old. Understandably, both parents were heartbroken. But Mrs. Lincoln was so devastated that a dark depression overcame her — so dark that the president feared for her sanity. She reported seeing ghosts in the White House, including Thomas Jefferson, Andrew Jackson and John Tyler. The Lincolns attended at least one séance in nearby Georgetown in 1863, hosted by a known trance medium, Mrs. Cranston Laurie. 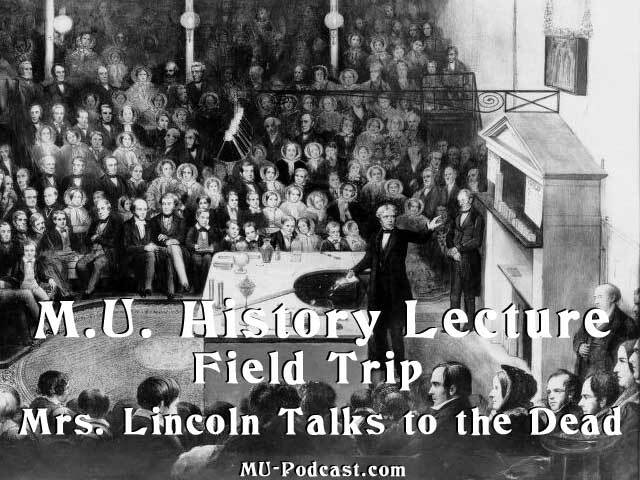 Then, Mrs. Lincoln began to invite mediums to the White House. I’m standing in front of the White house now, in view of the so-called Red Room, which faces the front and is just to the left of the mansion’s grand entrance, on the ground floor. A number of Seances were held there. White House seamstress and former slave Elizabeth Keckley introduced Mrs. Lincoln to one of those Spiritualists, a man who called himself Lord Charles J. Colchester. Attendees at the White House session heard scratching on the wainscoting and rapping on the stately furniture. Mr. Lincoln, who was quietly skeptical, asked the first secretary of the Smithsonian Institution, electromagnetic scientist Dr. Joseph Henry, to investigate. Henry debunked the noises, claiming they had been made using a device concealed in Colchester’s clothes. Mrs. Lincoln was not convinced. In the summer of 1863, Journalist Noah Brooks attended one of Colchester’s séances. He paid an entrance fee of one dollar, at the home of a “Washington gentleman.” In this demonstration, Colchester placed musical instruments on a table surrounded by seated guests. When the lights went out, the drum beat, the banjo plucked, and the bell rung, all apparently without the aid of human hands. However, Brooks struck out in the dark, and grabbed a fleshy human hand that was working the instruments in the dark. The hand clocked Brooks in the head with a bell and drew blood. The meeting dispersed into chaos. Brooks not only exposed Colchester as a hoaxter, but a few days later Mrs. Lincoln confided that the medium had demanded that Mrs. Lincoln procure a train ticket for him through finds from the War Department. He had threatened to say “unpleasant things” if she refused. Brooks confronted Colchester, and the man quickly left Washington. Scholars believe this incident signaled the end of the White House séances. But after the assassination of her husband, her condition deteriorated. She continued to search for Willie with mediums in Boston, New York and Philadelphia. In Chicago, she once told her other son that someone had tried to poison her on the train, and that a “wandering Jew” had borrowed her pocketbook. Her son committed her to an asylum in Illinois after she jumped out of a second-story window to escape a non-existent fire. She smuggled letters to Spiritualist allies, who helped her escape. She died in 1882, after a lifetime of chasing phantoms. — this dispatch was from Dorothea Strange, reporting from the White House.